Inside the Narcissist’s Mind and Their World of Illusions! A narcissist possesses specific traits, like requiring excessive admiration or having a sense of entitlement. If you’ve worked for or lived with a narcissist, then you probably know that they see themselves differently — preferentially — in comparison with other people, making the people around them less valued. They victimize the people around them by being who they are. Any relationship with a narcissist can be toxic. A narcissist builds you up as they know it is what you need. You’re in pain. You’re suffering. Next, the “magic” occurs — they appear all of a sudden to make you feel better only to tear you down later. You allow them to do so. They tell you you’re disgusting, incompetent, unreliable, untrustworthy, immoral… These people believe it is their right and behave how they want anywhere and anytime, disregarding any social conventions and norms. These people lie to you and you believe them, as they do not sound like they’re lying. They feel entitled to it, as you’ve given them your energy and trust, and you’ve invested your dreams and hopes in them. Unluckily, you derive your confidence from narcissists. They do not apologize. But, they think that you must accept, understand, and tolerate them, regardless of what they say or do. They wish you could be equals, but they remind you that they are the smartest person in the room and how well they did as a parent, in business, in school, etc. — and they believe that you must be grateful. They hope you appreciate all that they are and everything that they’ve achieved for you — since they’re nice and faultless. 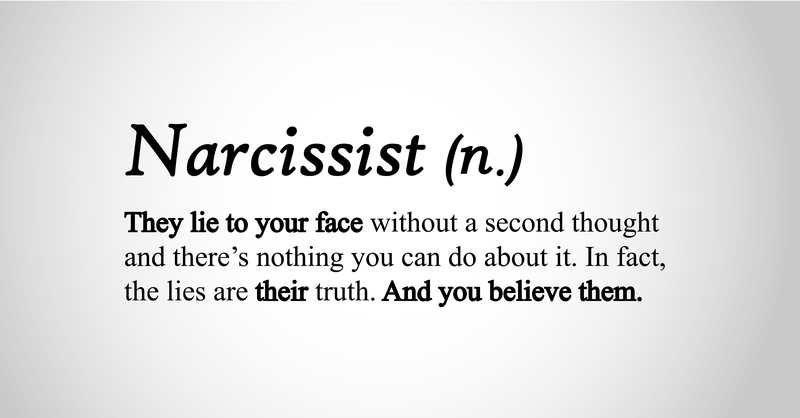 You may go and tell others about the narcissist, but they will not believe you, since they see the “amazing” person that’s the narcissist. You may come off as an unstable person that’s not able to control their emotions. What’s more, they also tell you they’re disappointed in you and that you’re the one that’s negatively affecting their reputation. You’re the one that make them lose control and rage, and that frustrates them. But, their life is just an illusion. They don’t know what they do or why they’re doing it. They don’t want to be questioned about their behaviour, since they reconstruct the reality and the facts. They act out their illusions. Good for them, others value their traits, so they can live in their world of illusions. Narcissists use co-dependent individuals, including you in order to keep the magic of their illusions alive.